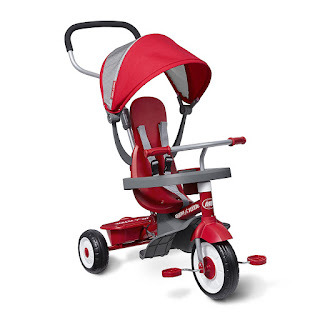 Head over to get this Radio Flyer 4-in-1 Stroll 'N Trike for ONLY $69 (Retail $89)! The 4-in-1 Stroll 'N Trike is the ultimate grow-with-me trike that offers 4 ways to ride. It easily converts from an infant trike to a steering trike, learn-to-ride-trike, and finally a classic trike. The trike features removable wrap around tray with cup holder, adjustable UV blocking canopy, and a 3-point harness for safety. It also has wide rear wheels to provide a quiet ride, removable footrest for early stages, and a rear storage bucket. The parent steering push handle removes for older riders. The sturdy steel frame and adjustable seat ensure it will last for years.